Description: RPC-107 references two objects, RPC-107-1, and RPC-107-2. RPC-107-1 is a shard of wood1 that is a square based pyramid in shape, 20cm long with a 5 by 5cm base. RPC-107-1 is a reality hazard with a profound effect on its local reality. Upon removal from containment, RPC-107-1 will extend a field of influence in an █m radius around itself that reverts the reality inside to the state it was in the year ██AD23. The view into the sphere of influence remains the same as it was previous to the expansion of the anomalous field, with the exception of RPC-107-1, RPC-107-2, and any human beings within the field; these will all cease to be seen. It is a quirk of the anomaly that moving objects cannot be observed from outside of the field, the environment appears completely static. The view from within RPC-107-1s effect, of the landscape that is outside of the influence of RPC-107-1s effect, is the view of the environment as it was in ██AD. Human beings and RPC-107-2 are the only objects that are not affected by the reality-altering effects of RPC-107-1; clothes, testing equipment, buildings and any other man-made object not present in ██AD will cease to exist in the local reality of RPC-107-1. Upon the cessation of RPC-107-1s reality-altering effect, whether by physically exiting the area of space that it resides in or by stopping the effect entirely, any immobile object4 will remain where it was placed, and where it was observed to be from outside of the effect. Any mobile object5 will come into existence where they would be expected to be factoring in motion, for example, clothes will remain worn by a person exiting the field of RPC-107-1 even when the clothes did not exist within the reality of RPC-107-2. The effect of RPC-107-1 can be assumed to exist as an enterable layer that is on top of the regular layer of reality that is experienced, as posited in the ██████████ theory posited by Dr. ██████████ of the Site-06 Reality Hazard Unit. The reality inside of RPC-107-1's effect is highly unstable. Utilizing a ██████-based directed quantum entanglement device, the Site-06 Reality Hazard Unit was able to determine that the reality inside of RPC-107-1's effect has an instability factor of 5 Schrödinger Instability Units (Sch) when compared to baseline instability of our reality. The particles directly around the sphere of influence of RPC-107-1 have been measured to have an instability factor of 15 Sch, making the risk of unstable reality anomalies presenting in our reality considerable. RPC-107-2 acts as the primary containment device of RPC-107-1. RPC-107-2 takes the form of an ornate, Catholic style reliquary that has been radioisotopically dated to be ███ years old. 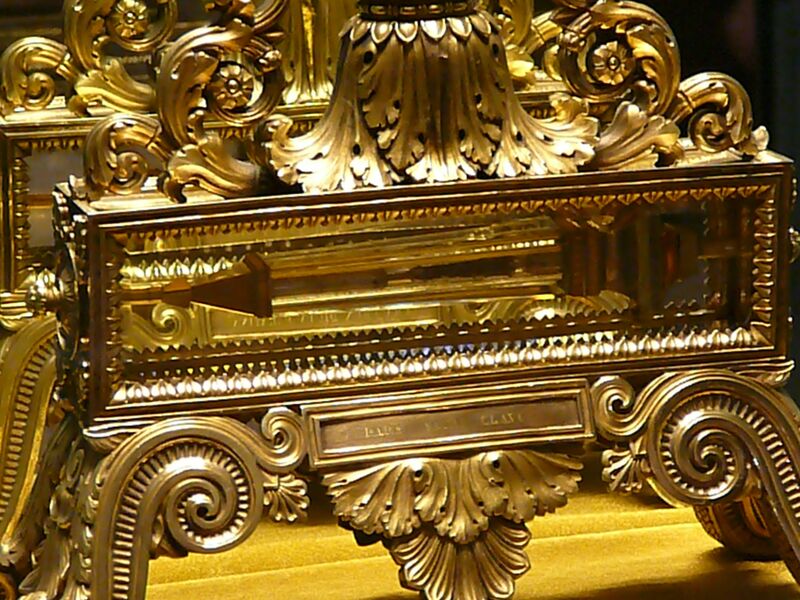 The object is made from gold and glass and is decorated with multiple crucifixes and Latin scriptures. RPC-107-2 has been specifically designed to hold RPC-107-1 within the glass section, and actively displays RPC-107-1. While RPC-107-1 is within the glass section and RPC-107-2 remains sealed, the effects of RPC-107-1 are nullified. Recovery: RPC-107 was recovered by MST-Golf-1, 'Crucifix Chasers', along with attache from Dr. ████████'s Reality Hazard Containment Team, from a previously sealed crypt in █████, Israel; based upon information gathered from RPC-0██. Radioisotopic in combination with decay-based aging techniques confirm that the crypt is ████ years old. Along with RPC-107, eleven (11) male bodies, ranging from 40 to 80 years old at the time of death, were found. The bodies have been radioisotopically dated to be ███ years old. "Based upon details gathered about the instability of the RPC-107 anomaly, it is the conclusion of my teams report that RPC-107's effect has an inordinately high risk of spawning unintended reality based anomalies. It is our recommendation that testing is suspended immediately" - The conclusion of the Site-06 Reality Hazard Unit's report on RPC-107. RPC-107 is currently being actively persued by [GROUP NAME REDACTED]. Members of MST-Golf-1 'Crucifix Chasers' have been deployed in sureveillence roles in [PLACE NAME REDACTED] for preventative strike co-ordination. 2. Based upon radioisotopic dating of material removed from inside the influence of RPC-107-1. 3. The sphere of influence expands at a rate of 0.99998 c upon initialization based upon current testing. 4. Buildings, static furniture, etc. 5. Clothes that are being worn, objects in motion, etc.